If you're in LA, I'll expect to see you all at the corner of Olympic and Broadway at 11 am on 11 January (that's Saturday morning, sorry). Yeah, we're on the march again...if you need a ride, I'm driving. 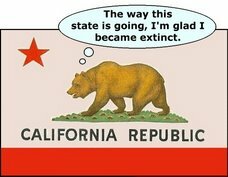 And yes, this time I promise to carry the sign: U.S. OUT OF CALIFORNIA. You'd better get down there...otherwise it's WAR! P.S. Am I the only one who noticed everybody saying that NOT finding any proscribed weapons in Iraq actually made a war more likely??? Okay, here's some free money (ergo the title of this missive). Seems some friendly attorneys won a class-action suit against the record companies for price-fixing CDs, and if you bought a CD between 1995 and 2000, you also won. I've checked this out thoroughly (thanks, Trish) and it is NOT a hoax. The maximum payout is $20, but hey, it's from a *record company*. Although I don't usually read the "New Yorker", I like the catty tone of this column about our new "Axis of Evil" and who thought it up. And I'm glad to see someone start up the "war at home". They started this as a joke, and people are flooding them with money. I know I've got my checkbook ready.